Downloading your favorite TV show is much easier than it was a few years ago with the help of torrent indexing sites and great software. With the arrival of the open source TVShows application, the whole thing just got even easier. For those who enjoy watching TV shows but don’t always remember to download them ready to watch, the ‘TVShows’ application may be just what they need – it automatically downloads your favorite TV shows whenever they become available, so they’re ready whenever you are. 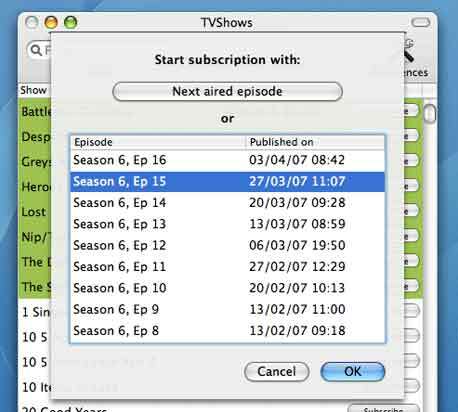 Subscriptions to various shows are managed from within the application. Once set, the software runs silently in the background checking to see if .torrent files are available for your chosen shows yet, and if they are it downloads them by triggering an instance of your favorite BitTorrent client and the download begins. TVShows is able to download the correct episode from within a series and offers a choice of video qualities to download – Normal, High and Very High. The open source TVShows 0.2 runs on Mac OS X 10.4+ and is available on SourceForge. Windows users may like to try Ted, the Torrent Episode Downloader.